Sometimes people think they are losing the faith of their fathers and mothers as they examine more closely the texts, traditions, and history of their faith. And in one sense, they are. The faith of our childhood, just as our preferences for particular foods, changes over time and the maturing of our minds. Just because I no longer consider Dreamsicles the ultimate and best of all foodstuffs, does not mean I don’t like them anymore! It simply means I have had the opportunity to experience other foods, while understanding much more about nutrition and health. I still like to eat!- that’s the point. But the food that satisfies me now is different than when I was six years old. So, too, my faith in and understanding of things godly and divine. There have been other such lists of faith-stages written about over the centuries, but Fowler’s was based on objective criteria gathered within scientific, sociological parameters. His is the go-to beginning of any objective investigation into the “kinds” of faith evidenced in any faith system. I think I could best summarize what I’ve learned from his first book and other subsequents books and articles by him and his team, with this basic statement: We don’t all ‘believe’ the same way. That sounds elementary, and it is. But it’s antithetical counterpart is heard in various forms of this doctrinal statement all the time: We must all believe the same way. And, it turns out- of course- that that is a humanly impossible thing to do. The only solution to the natural movements of human minds and perceptions and abilities to draw conclusions about what we perceive are various forms of brain-washing! Some of those forms of coerced “homogenizing of thought and action” are pleasant- choral music is such a homogenizer. But most coercive brainwashing is based on suppression of information by punishment, threat, or fear. 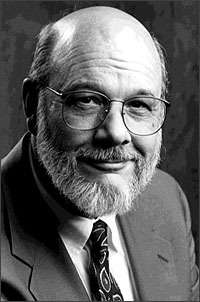 Objective studies, like Fowler’s, can help all believers to understand the movement of one’s cognitive understandings through faith in such a way that change can be welcomed, even encouraged. 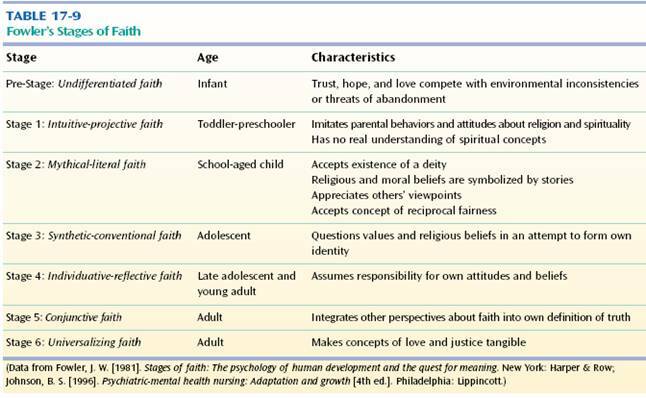 The following are Wikipedia’s synopses of Fowler’s six stages of faith. Only when a person is coerced or makes the choice to “stay within” a level can any level be determined to be the wrong level for a person. Nor are the “higher” stages the “best” or “only” stages to which to aspire. Inevitably, however, some persons will move into a stage of faith, because of age and/or the maturing of the mind, or by simply having more knowledge than they did before. Their forms of faith change. To some it may appear that another’s faith is evaporating when, in fact, its form is changing. Stage 4 – “Individuative-Reflective” faith (usually mid-twenties to late thirties) a stage of angst and struggle. The individual takes personal responsibility for his or her beliefsand feelings. As one is able to reflect on one’s own beliefs, there is an openness to a new complexity of faith, but this also increases the awareness of conflicts in one’s belief. All of these descriptions are intended here to be only a basis for thought and discussion. They are valuable when talking to or teaching others who may be in different stages of faith. It can help avoid frustration when communicating with someone (or some group) who is in a different stage of faith and understanding. It is possible to “adjust” one’s language and use of metaphors so as to better be heard by others. It is possible to listen to what is behind basic statements of faith that a person may be having a difficult time expressing. Again: The stages are NOT a means of “grading” one’s faith, depth of faith, or orthodoxy. They ARE a way of understanding that another’s understanding may be different than yours. One would not hand a Sunday School comic book to a person like Mother Theresa and expect her to stay interested very long. Nor would someone be very nice at all in trying to explain the loss of a loved one to a someone who had just gone through catechism or confirmation by showing the relatedness of Judeo-Christian thought to Neo-Platonic or ancient Babylonian philosophies. All of those expressions are valid ones at a certain stage of faith, but it may not be proper in presenting them to someone at a different stage. Jesus spoke in parables to those who weren’t yet ready to hear a discourse on the ontological bases of God images in the Hebrew scriptures. In doing so, he enabled them to hear great truths that they may not otherwise have been able to learn and be illumined by. The “stages” presented by Fowler are important lessons for all persons of faith. We must know that everybody doesn’t think, see, hear, understand the same way we do! Understanding that, adjusting to that reality, and respecting where the other person is can lead to greater understanding and deeper faith, prevent countless arguments and many hurt feelings. They even stop wars before they ever have a chance to start!